The most famous region of Chile, Chilean Patagonia offers all the dramatic landscape one would expect from the world's ultimate land's end. Here the South American continent falls away in a dazzling explosion of islands, glaciers, icebergs and mountains. It is truly one of mother nature's grand finales. Magellanes is also home to the southern city of Punta Arenas, which first became prosperous during the California gold rush. The city's site on the Pacific side of the Magellan Strait made it an ideal transshipment point for cargoes rounding the continent. Later, the city became the capital of Chile's wool industry, which produced some of the richest barons on the continent. 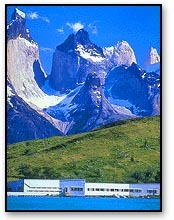 Among the other wondrous sites in this remarkable region are: the Torres del Paine, a spectacular mountain range, which frames the Park of the same name, and extend to heights of up to 9,000 feet; the Cuernos del Paine, with a height of 6,300 feet; the hypnotic waterfalls of Salto Chico and Salto Grande; the Grey, Pingo, del Frances and Dickson glaciers; the Pehoe, Nordenskjold, Sarmiento, Pingo and Dickson lakes; and the Verde and Azul lagoons. Copyright (c) 1998 - 2010 - 2008 interKnowledge Corp. All rights reserved.